For over 20 years our seasoned professionals having been paving the Barrington area. Our ongoing focus is to give you numerous options and great service on your Asphalt or Concrete project. 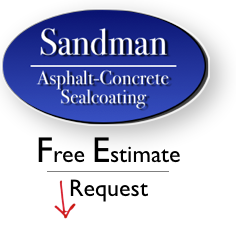 Sandman Paving’s Asphalt Driveway services include. New Driveway installation- We’ll build it from the “dirt” up. Driveway repair – Crack filling, Hole filling, patching, Leveling and more. Driveway sealing- A Seal coat will make your driveway look new and extend it’s life. Driveway paving- Whether it’s a resurface/overlay, Full reconstruction, or remove and replace, we’ve got you covered. Sandman also prides itself on performing very detailed, high quality concrete work. We’ve been working with local business owners and property managers for many years and have designed multiple options for Parking Lot repair and maintenance. For a quick quote just fill out the form on the right side of this page or give us a call at 847-836-6071. We are here to answer your questions about our concrete or asphalt paving services. We look forward to speaking to you soon about your Barrington paving job!